Michael J Fox and Peter Jackson on The Frighteners set. Christchurch Star archive. In copyright. CCL-StarP-00537A. Michael J. 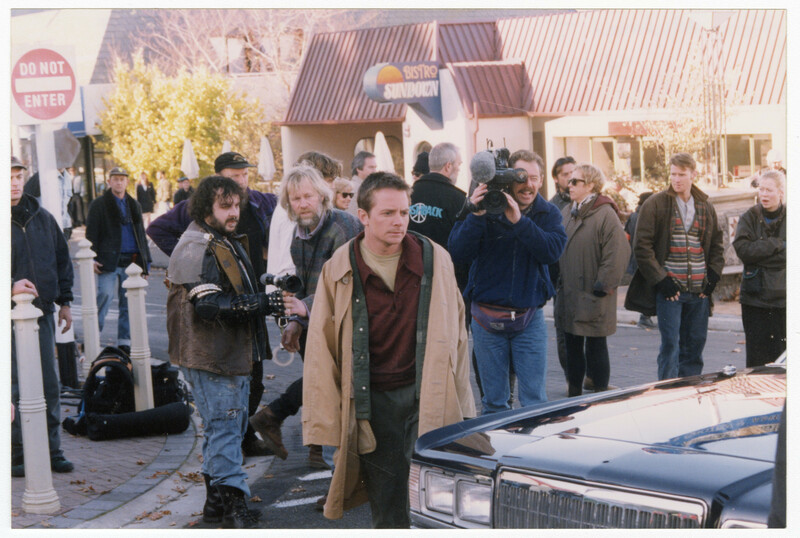 Fox and Peter Jackson on the set of The Frighteners in London St, Lyttelton, Christchurch. The Lyttelton Post Office (now part of Lyttelton Library and Customer Services) is seen in the background, but was turned into Bistro Sundown for the movie. Also pictured, standing next to Jackson is Kiwi cinematographer, Alun Bollinger. May, 1995. Do you have any photographs of Lyttelton? If so, feel free to contribute to our collection. The Discovery Wall is a large interactive exhibition which allows several people to simultaneously explore images and stories of the history of the people and places of Christchurch. It is viewable on the ground floor of Tūranga, 60 Cathedral Square, Christchurch, New Zealand. Images displayed on the Wall can also be found on the Discovery Wall website.